In a twinkling of an eye, we are now in 2019. The year of 2018 has been an intense year of change. The Universe has been utilizing the Photon Energy with the planetary movement to forge humanity to continually move forward to higher vibration and consciousness. We will experience more change in 2019 as the Planet of Saturn (the great teacher), Pluto (the great transformer) and North Node (the direction of destiny) are all in Capricorn (Authority, structure and material reality) and approaching conjunction with each other. Regardless of whether we are ready for or not, the Universe is continually forging us to move forward in vibration both individually and collectively. The process of change always brings chaos, uncertainty, confusion and insecurity as we are letting go something we have hold so long and buried so deep, and as we allow the new energy coming into our life and the new is forming. Our readiness to be open and to embrace change, or our stubbornness to hold onto the past, the old way of life and to resist change do make the change easier or harder. We make the choice. This affirmation is designed to assist each of us to continually embrace change and to have the courage to face our fears and to go with the change that the Universe is bringing into our lives. Change brings freedom, new friends, new career, new relationship and new way of life, and it is meant to be positive. 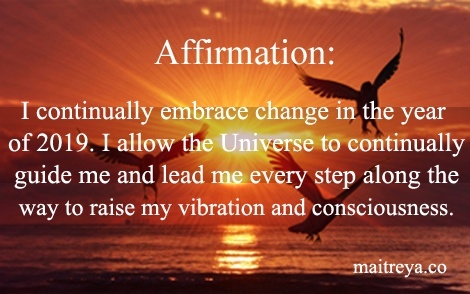 By saying the affirmation, each of us can start the process of change. You can repeat the affirmation as many times as you want. The more you say it, the more positive change you can manifest in your life.